On Thursday night, 2020 hopeful Bernie Sanders became the first Democratic candidate to accept an invitation into enemy territory by holding a town hall event broadcast by Fox News. Sanders opened himself up criticism by going on a network that essentially serves as an extension of the Trump White House comms shop, but given the appearance was a calculated risk that paid off, not in the least because Sanders managed to get an entire Fox News audience to applaud single payer healthcare. 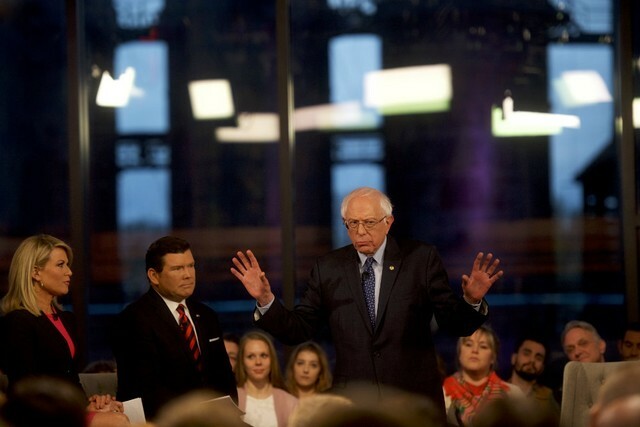 Sanders spent the bulk of the town hall discussing the Medicare for All policy that he is running on, and stayed on message even as Fox News anchors Bret Baier and Martha McCallum challenged him on his key talking points. At one point, Baier—who fancies himself as principled stalwart of Fox’s news division and not one of the incendiary Hannity-Carlson-Ingraham style opinion hosts carrying Trump’s water—inadvertently set himself up by polling the audience on whether they would like to receive medical care under a Medicare for All model rather than through private insurers. Baier was pressing Sanders on the notion that a single payer healthcare system administered through the government might eliminate the need for private insurers, and it was clear that Baier was over-estimating the audience’s fondness for… insurance. As the following clip shows, the audience was on Sanders’s side. Another major coup occurred when MacCallum was booed on her own network for asking a bad faith question about Sanders’s fight against voter suppression. The town hall was held in Bethlehem, Pennsylvania, an area that voted heavily for Trump in 2016. According to local newspaper The Morning Call, the network “reached out to various political and local groups in the area and mined requests to attend after it publicly announced the event” and Baier characterized the crowd as a mix of Democrats, Republicans, and Independent voters, though the first question of the night, the one about Sanders’s wealth, came from a Turning Point USA student organizer, so let’s not give Fox News too much credit.